This Japanese adventurer, who was 41 at the time, set out from Patriot Hills on 10 December. His original goal was to reach Pole in time for New Years Day, but his trip was delayed by unexpectedly deep snow as well as rough sastrugi. 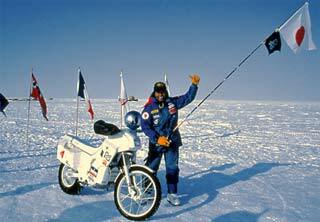 Kazama and his team reached Pole on 3 January 1992. 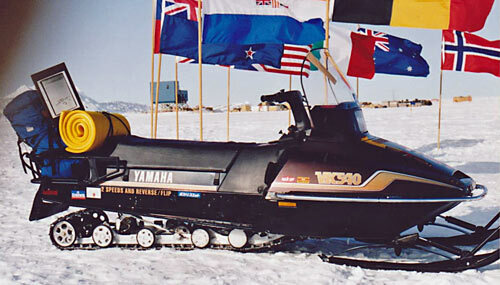 The motorcycle, seen above, was a modification based on the Yamaha liquid-cooled DR200, with the engine area heavily insulated. 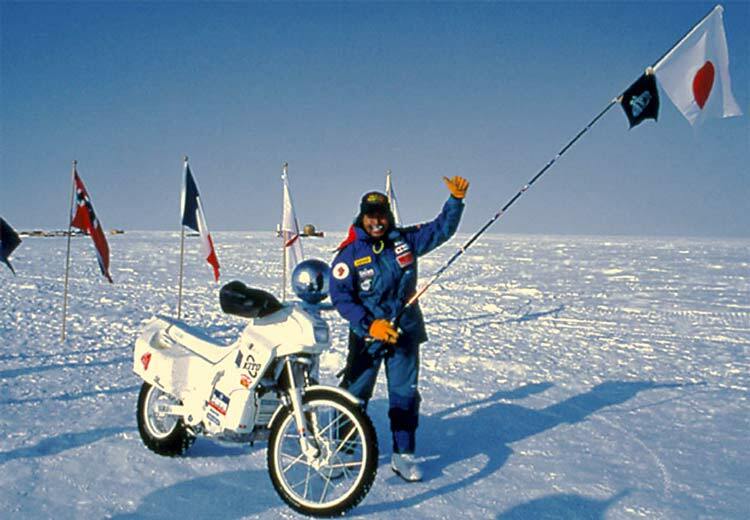 Shinji had previously reached the North Pole in April 1987 on an air-cooled Yamaha (perhaps a modification based on the TW 200 and/or TY250), so he is the only person to reach both Poles by motorcycle. His other exploits included altitude records for motorcycle climbs on Everest (to 19,701 feet in 1986) as well as Mount Kilimanjaro and Mt. Fuji. He was the first Japanese finisher in the Dakar Rally motorcycle race in 1982, and although he was severely injured in that event in 2004, he has continued to participate in cycling, motorcycle and other extreme distance events. His North Pole trip set out from Ward Hunt Island in what is now Nunavut, Canada, and he was accompanied by a support team of three Japanese and 2 Inuit on two snowmobiles. While the straight-line distance was 470 miles, the actual trip covered 1,250 miles over 44 days, due to shifting ice conditions. 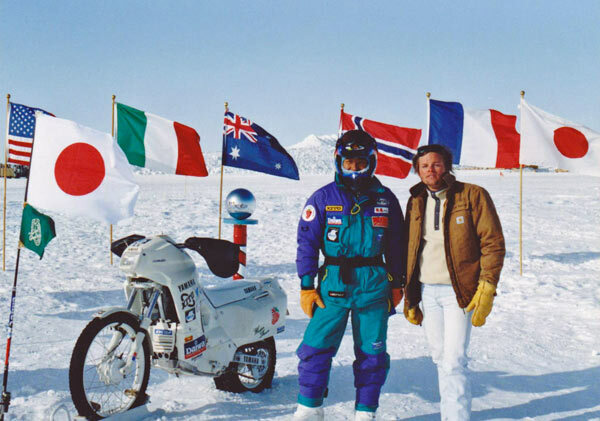 At left is another Ceremonial Pole hero shot--this is from this April 2015 motorcycleboy.fr blog post which features more photos and information about Kazama's trip. Shinji's 24-day speed record would stand until December 2005, when a mostly-British team drove a modified 6x6 Ford Econoline from PH to Pole in a bit more than 69 hours. Shinji Kazama has continued to be active in extreme cycling and other such events despite a severe accident during the 2004 Dakar Rally which left him using a cane. And he has not forgotten the South Pole...in 2014 he was developing the "Humans Ability" South Pole Expedition" which proposed bringing a team of able-bodied and physically challenged folks to take on a 26.2 mile marathon distance at Pole. Which apparently did not happen. Thanks to Frederick McDougall for his two photos!